So last night I decided to hangout with some vikings, and catch some totally sick viking metal. 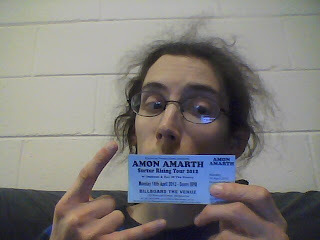 That's right my faithful readers, I rocked to Amon Amarth. Johan has got the most amazing voice, I can only imagine he tells the best campfire/ghosts stories. Awesome show, and the openers Eye of the Enemy and Orpheus were good too. Then, tonight, I decided to go grab some coffee with a buddy. Well, as we were heading towards DeGraves Street in the CBD, we ended up walking through the set of a movie being filmed (I, Frankenstein). I had seen tons of filming trucks around for a few months, anyways, they happened to be filming a street scene down Flinder's Lane. Fog machine, car, etc etc. Anyways, I saw them film a dude run on top of a car. Pretty neat.